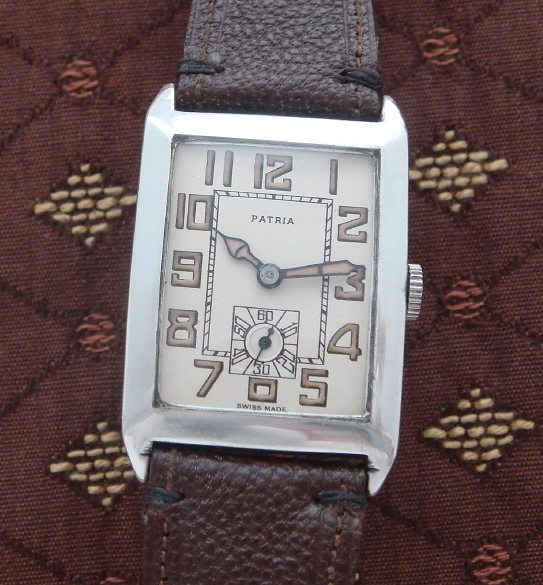 We are delighted to offer this remarkably crisp, World War I era Patria gentleman's dress wristwatch. As many of you may know, Patria movements were produced by Omega and marketed under the Patria name. During World War I, Omega made a brilliant marketing decision by entering a still unproven wristlet market created by soldiers in Europe. Their Patria name became synonymous with the trench watch, and by the end the war, every man recognized the advantage of having a watch on his wrist — instantly accessible — versus a pocket watch that one would have to fumble to retrieve. The move proved to be quite profitable for Omega. Today, Omega is one of the finest watch houses in the world, while their vintage "Patria" examples are highly collectible. This dress example, in a solid sterling silver case, would have been the pride of some wealthy World War I era gentleman. Measuring 38mm by 26mm, it is in remarkably good original condition – the sort of watch one would see in a Hollywood production on the wrist of the leading man. The hinged case is as tight as the day was made and quite handsome in a sublime, minimalist sort of way. It features a magnificent and completely original metal dial — marked Patria — with oversized numerals, sub-seconds register, and stained-glass hands. Open its hinged back and you'll find a completely and professionally serviced, 15 ruby jewel Patria movement that is as remarkable today as it was when it was manufactured.